Supporting the performing arts to do great things. Activate Performing Arts produce, promote and develop performing arts in Dorset. Activate works with venues, communities, educators and artists to create large-scale performing arts events in Dorset. From carnivals to workshops, to huge outdoor arts festivals with over 100,000 visitors, Activate delivers a wide ranging and vibrant programme of performing arts within the South West. We've worked with Activate since 2006 to deliver print, design and digital solutions, which, helps them to deliver their impressive programme and to grow as a national portfolio organisation. 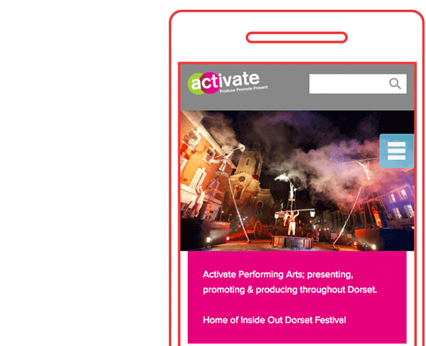 Activate needed a flexible website to serve as the place to go for everything performing arts related in Dorset: a directory of artists and companies, opportunities and resources. Their old website reflected neither the scale of the projects they delivered nor their purpose, so we focussed on large visuals featuring their core message of "Produce, Perform & Promote." We also worked on integrating the separate Inside Out Dorset website with the new core Activate website, to not only help people make the connection between their organisation and the festival, but to also ensuring it retained its own identity. We developed a fully-editable website powered by Drupal. It integrates with their customer relationship management system, and has a fully-operational user registration system which powers a publicly-browsable directory and opportunities database. The website includes events listings and a calendar, with filterable content based on tags. Like most arts organisations, Activate maintains strong relationships with their audience, so the website includes an online donation tool and Mailchimp newsletter integration. Over the years, we've helped develop various brochures, flyers, booklets, leaflets, posters, banners and signage for Activate as well as partner side projects. One of the most fun aspects of working with Activate has been developing mini 'brands' for their various one-off events and projects, and getting to be part of the performance by modelling! "The team at Wired Canvas have produced consistently excellent work for our organisation over the years they have been working for us. The design concepts and solutions they present are always fresh and creative. Attention to detail and swift turnaround all make for a great design company for Activate."